Waruga is an old cemetery or graves that located in Sawangan, North Sulawesi. Waruga derived from two words meaning the Waru home and Ruga meaning body. So, literally Waruga is the place for the body that coming home to heaven. That was what public believe in the Minahasa in ancient times. The tomb is made ​​of carved stone and shaped like a house that has been around since the 1600s. At that time each family has its own tomb made ​​of stone. 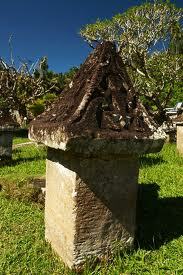 Initially tomb stone for the family scattered in several villages in the district of Minahasa. When outbreak of cholera and typhoid, in which the suspected source is the family tomb, finally by the local government, whole tomb stones were collected in one place. The tomb stones form tells the occupation or profession from the body buried in waruga it. For example, if the pictures of animals occur, then the person who died was a hunter.